DCP 4801 and DC 4346 with a mainline shunt south of Christchurch. The New Zealand DC class is a class of diesel-electric mainline locomotive on the New Zealand rail network, operated by KiwiRail on freight trains, and formerly on long-distance KiwiRail Scenic passenger trains. The class was rebuilt from the DA class in the late 1970s and early 1980s, mainly in Australia. After the DA class they were the most numerous class of diesel locomotive on New Zealand's railway network, and remained numerically dominant until the mid-2010s when withdrawals began. The locomotives started life as DA class, built by General Motors Canada between 1955 and 1967. Between 1978 and 1983, 85 of the later-build DAs were rebuilt as EMD model G22AR, designated as the DC class, with upgraded engines, new cabs and low short hoods of a style similar to the DX class introduced earlier in the 1970s and the DF class being introduced at the time. Five were rebuilt at the Hutt Workshops near Wellington and the other 80 at Clyde Engineering in Australia. Each locomotive has a General Motors 12-645C or 12-645E V12 diesel engine (the same as originally fitted to the DF class) and four traction motors, with an authorised maximum speed of 100 km/h. They are 14 metres long, has a height of 3756 mm (12 ft 4in) and weighs 82 tonnes. They can be readily identified as they are considerably shorter than the DF and DX classes and have their paired headlights arranged horizontally, rather than vertically on the DFs. The five 49-series Hutt-built DCs originally retained the 12-567 engine, before later receiving the 12-645. The class was initially employed in the North Island, mainly on freight trains but also hauling either carriage trains or depowered 88-seater railcars. Changes came during the 1980s; the deregulation of land transport saw rail freight volumes decline and the opening of the NIMT electrification saw the locomotive fleet reallocated. These factors saw the withdrawal between 1985 and 1989 of the DJ class and remaining DA class, with the DC class also seeing regular service in the lower South Island as a result. DC 4254 in service for ARTA (now Auckland Transport) at Papakura in 2006. For several years the class were employed on suburban carriage trains in Auckland. Since 2003 the operation has been run under a service contract by Transdev Auckland and its predecessors, through firstly the former Auckland Regional Transport Authority (ARTA) and now through the Auckland Council subsidiary Auckland Transport. 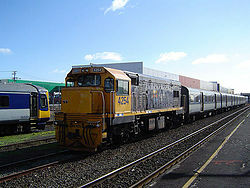 Until July 2015 up to 20 DC/DCP locomotives – along with three DFB/T units – were leased to Auckland Transport, operating in push-pull mode with Auckland Transport's ex-BR Mark 2 SA/SD cars. Originally the DC units were configured with a set of 3 SA cars and a SD driving car, but with an increase in rail patronage some longer trains were provided on the Southern and Eastern lines with the addition of a fourth SA car. 17 DC locomotives were painted in MAXX blue livery, with four other units that saw regular service with AT – DC 4104, DC 4260, DC 4346 and DCP 4818 – in KiwiRail livery, along with DC 4594 which was Toll-livered at the time. All locomotives in service with Auckland Transport were fitted with controls for the carriage doors, and later received Electronic Train Protection (ETP) equipment. One of the MAXX painted locomotives, DC 4732, was heavily damaged when it derailed at Westfield as an empty service on 2 March 2014. Following the availability of sufficient numbers of the AM class EMUs to operate the Auckland network the majority of the diesel locomotives have been returned to KiwiRail, with a number of them being stored at Hutt Workshops. The class continues to be a major workhorse, operating either as single units or in multiple with other DC units or locomotives from the DFT, DX or DL classes. The class were used on KiwiRail Scenic's South Island Coastal Pacific, and was also used on the North Islands Northern Explorer until being replaced by a DFB/T, DXB or occasionally a DXC unit and on the TranzAlpine until being replaced by two DXC units. A unit is also occasionally employed to haul the Capital Connection service. The Northern Explorer's predecessor, the Overlander, was usually hauled on the northern and southern sections of the North Island Main Trunk by a DC locomotive, and was often used across the central section as well if an EF locomotive was unavailable. The DC class previously hauled Wairarapa Connection services between Masterton and Wellington. The locomotives were allocated on a daily basis, rather than being permanently assigned as is the case in Auckland. In July 2015, the DFB class replaced the DC class hauling the service. Initially the class was numbered sequentially from DC 1551 (the DA class having ended at 1545, the DF class started at 1651). In 1980 the computerised Traffic Management System (TMS) was introduced and the class was renumbered with a four-digit number commencing with '4', with the last digit a check digit. The 49 Clyde-built units were renumbered in sequence with DC 1551 becoming DC 4006 and DC 1599 becoming DC 4536, though only the first 31 (up to DC 1581) had entered service by that time. The remaining Clyde builds received TMS numbers through to 4876 as they entered the rebuilding, while DC 1582–1589 entered service with their original 15xx series numbers on the headlight number boards and the later 40xx TMS numbers on the long hood. Initially, the Hutt-built units retained their DA-sequence TMS numbers, as NZR considered them to be DA locomotives as they retained the 12-567 engine. Eventually, this decision was changed and they became DC 4916-DC 4951, with 4882 and 4899 not used to keep them in a separate number sub-series. DCs 4876 and 4726 approaching Waipara with a freight train in April 2016.
International Orange (Fruit Salad) - The livery as introduced. DC 4409 is notable as having received a large touch-up of its paint job in this scheme in 2012. Flying Tomato - A variation of Fruit Salad, where orange was substituted for the grey. Some locomotives which received this paint scheme were later painted back in Fruit Salad. No DCs still wear this livery. NZ Rail Blue - The DC class were the first to debut this livery in 1991, the first locomotive in this livery was DC 4922, with the orange replaced by a mid-blue and either "NZ Rail" or "New Zealand Rail" on the long hood with numbers painted on the cab sides. Later in the Tranz Rail era, some locomotives received Cato Blue sticker patches over the long hood lettering with the Tranz Rail logo attached. Cato Blue - A variation of NZ Rail Blue upon the launch of "Tranz Rail" in late 1995, where a sky-blue colour (Cato Blue) replaced the mid-blue and the Tranz Rail "winged" logo was placed on the long hood. Later the rights to Cato Blue were sold to Tranz Scenic 2001, and a number of their DCPs received repaints in the livery but with the Tranz Scenic logo in place of the Tranz Rail logo. Bumble Bee - DC 4323 was the first locomotive to wear this livery, which consisted of the long hood being black, with the hood end, short hood and cab painted yellow. The first two DCs wore the Tranz Rail winged logo on the long hood Later locomotives instead had block "TR" letters in yellow on the long hood. MAXX Blue - A variation of Bumble Bee with dark blue on the long hood (with MAXX logo displayed), although with black long hood top and without the extended yellow rear area on the long hood. DC 4444 had a variation where large numerals similar to the Fruit Salad livery were displayed on the long hood in the place of the MAXX logo, and nothing on the cab sides. The livery was for locomotives leased to ARTA to operate suburban services in Auckland. Toll Green (Corncob) - A variation of Bumble Bee where Toll Green was substituted for the black, a lemon yellow replaced the former yellow colour used and the Toll Logo displayed on the long hood in addition to Toll logos on each end of the loco with three green whisker stripes. Later after Toll sold their stake in the railways in 2008, KiwiRail patch stickers were placed over the Toll logos. KiwiRail Phase 1 (KiwiFruit) - The first introduced KiwiRail livery, with DC 4260 being the only example to receive it. KiwiRail Phase 2 (KiwiRail Bold) - The revised livery, which is now the most common livery on the class. In addition, DC 4093 wore a special one-off "Kiwi Lager" livery to go with the Kiwi Lager Ski train, and DC 4346 was one of two locomotives to wear a brown with yellow ends "Tasman Forestry" livery. In March 2001, the Rail & Maritime Transport Union threatened to set the maximum speed of the DC class to 50 kilometres per hour due to corrosion found on cab mounts. This causes the cab of a DC to detach from the frame during a derailment, and a driver had fallen through the floor of a unit. An audit was made on all units and found 19 locomotives had maintenance concerns. The concerned units were regulated to trail-only units, and work was made in a short matter of time to repair the cabs. It was understood the concerned units would be fitted with universal cabs, but this never commenced. In early 2017, concerns were raised by the RMTU surrounding rusty cab structures, cab mounting, and anti-collision posts. Fearing the cabs could have been ripped off in the course of an accident, all (but one) units were banned from leading in the South Island; again confined to trail-only units until they had been inspected. Although units in the North Island were banned from leading trains, they were seen being used on shunts. Work was carried out at both Hutt and Hillside workshops, most were back leading trains within a couple of months. The DCP sub-class was established in 2002 to differentiate locomotives owned by Tranz Scenic 2001 Ltd from those owned by Tranz Rail Ltd. 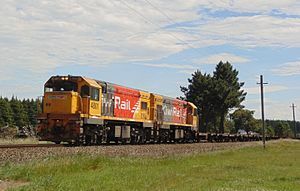 The DCP classification was retained on these locomotives after the purchase of Tranz Scenic 2001 by Toll NZ, and continues to be used by KiwiRail. Further units since received the classification, though it then referred to those DC locomotives that were fitted with bogie retention wire ropes to stop the bogies falling off in derailments, rather than locomotives dedicated to passenger workings. The practice of reclassifying has now been abandoned by KiwiRail, though most DCs, including all those used on Auckland commuter services, have received the bogie ropes. In May 1988, trials were carried out using GE's BrightStar control system on DC 4588 and DC 4939, which were unsuccessful. In November 1988, DC 4588 was fitted with the Canadian ZTR wheel slip system. The system substantially enhanced traction on the bogies, maximising traction potential. DC 4628 followed in December 1988 and was also a success. Over the next 10 years, 64 DC locomotives had ZTR fitted. Locolog was an event recorder system similar to a black box on aircraft. It was trialed successfully in 1986 on DC 4070 and DC 4778 before being fitted to all other main-line locomotives. It has since been supplanted by the locally produced Tranzlog system, with both systems having provided significant material to assist in accident investigations. In 2014, six of the class were fitted with fire suppression to run passenger services through the 8.8-kilometre (5.5 mi) Rimutaka Tunnel on the Wairarapa Line due to a change in requirements resulting from the Commission of Inquiry in the Pike River Mine disaster. This was removed from these locomotives in mid-2015 and reinstalled into the DFB class locomotives which took over the haulage of these services. However, fire suppression has been refitted to several members of the class in order to provide locomotives for passenger charter services and for back-up for The Great Journeys of New Zealand long-distance passenger services. As of February 2019, 63 units have been withdrawn from service. Units were withdrawn as a result of accidents, or on account of being surplus to requirements or poor mechanical condition. One unit, DC 4496, was taken out of service for an experimental rebuild that was later cancelled. 29 of the withdrawn units are in storage, with the remainder scrapped. The final withdrawn locomotive, DC 4588, was shipped to Tasmania (along with QR class locomotives) in December 1998 for use for TasRail, then part-owned by Tranz Rail and its parent Wisconsin Central through the Australian Transport Network. The locomotive was purchased outright by TasRail after an initial period used lease, but was placed into storage in October 2002 after suffering an engine problem. In 2005 rebuilding commenced for reinstatement, but the rebuild fell through and the loco was sold for scrap in 2011 at East Tamar Workshops. In February 2015, KiwiRail issued a Request for Quotation (RFQ) via the Government Electronic Tendering Service (GETS) for the disposal of 12 of DC class locomotives, with further tranches of locomotives being released from the fleet over the next two years. In mid-2015, KiwiRail confirmed the 12 DCs were purchased by Progress Rail for their 645 V-12 prime movers, and other usable parts to be salvaged and the hulks scrapped. It was also confirmed the 12 units sold were 4029, 4070, 4133, 4225, 4231, 4352, 4398, 4507, 4542, 4640, 4732, and 4784. All units have been scrapped as of December 2018. In August 2017, KiwiRail announced they were in discussions with global suppliers including General Electric, Electro-Motive Diesel, Alstom, CRRC and Stadler Rail to construct replacements for the remainder of the class. It is expected the first of the replacements to arrive in 2020/21. In September 2018, it was announced 10 DCs are planned to be withdrawn following the commissioning of the 15 new DL class, with 15 units to remain in service until 2021/22. In November 2018, KiwiRail issued a second RFQ for the disposal of four more DCs, being 4093, 4248, 4369 and 4818. 4093 was scrapped in January 2019, while the other three were purchased for preservation. DC 1574/DC 4248 and DC 1584/DC 4369 were purchased by Mainline Steam in 2018 for use on mainline excursions. They arrived at MLS's Plimmerton depot on 9 February 2019, where they both await restoration for mainline certification. DCP 4818 was purchased by Glenbrook Vintage Railway in 2018 also for use on mainline excursions. It has been designated as GVR No.14. In the 1981 film Goodbye Pork Pie, DC 1582 (later DC 4346) hauls a down (westbound) Midland Line freight train including the box wagon in which Gerry, John, and the yellow Mini were hiding. In the penultimate scene of the 1982 film Smash Palace, DC 4202 hauls an up (northbound) North Island Main Trunk freight train, which appears to be about to crash into a Model T Ford containing Al Shaw and policeman Ray Foley, but at the last second the train enters the crossing loop, missing them. DC 4790 made two appearances in Yogi Bear: The Movie. ^ "Media Release: Bus and Train Upgrades Announced". Retrieved 9 May 2011. ^ Norman, Emily (2 July 2015). "Faster locos mean timely rides - council". Wairarapa Times-Age. Retrieved 17 July 2015. ^ a b c "New Zealand Railway Observer". 58 (1). New Zealand Railway and Locomotive Society. April–May 2001. ISSN 0028-8624. ^ a b c "Railfan". 23 (3). Triple M Publications. June 2017. ISSN 1173-2229. ^ a b "Railfan". 23 (4). Triple M Publications. September 2017. ISSN 1173-2229. ^ "Railfan". 20 (3). Triple M Publications. June 2014. ISSN 1173-2229. ^ "Railfan". 20 (4). Triple M Publications. September 2014. ISSN 1173-2229. ^ "Railfan". 21 (1). Triple M Publications. December 2014. ISSN 1173-2229. ^ "Faster locos mean timely rides - council". Wairarapa Times-Age. 2 July 2015. Retrieved 28 December 2017. ^ "Railfan". 21 (4). Triple M Publications. September 2015. ISSN 1173-2229. ^ "Railfan". 23 (1). Triple M Publications. December 2016. ISSN 1173-2229. ^ "Railfan". 23 (2). Triple M Publications. March 2017. ISSN 1173-2229. ^ "New Zealand Railway Observer". 55 (3). New Zealand Railway and Locomotive Society. Spring 1998. ISSN 0028-8624. ^ "Railfan". 5 (1). Triple M Publications. December 1998. ISSN 1173-2229. ^ "Railfan". 5 (2). Triple M Publications. March 1999. ISSN 1173-2229. ^ "Railfan". 5 (3). Triple M Publications. June 1999. ISSN 1173-2229. ^ "New Zealand Railway Observer". 56 (2). New Zealand Railway and Locomotive Society. Winter 1999. ISSN 0028-8624. ^ "Railfan". 6 (1). Triple M Publications. December 1999. ISSN 1173-2229. ^ "Railfan". 6 (4). Triple M Publications. September 2000. ISSN 1173-2229. ^ "Rail Tasmania – DC class". Retrieved 22 August 2011. 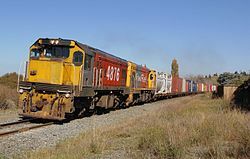 ^ "KiwiRail DC Locomotive Disposal RFQ". 5 February 2015. Retrieved 7 February 2015. ^ "Railfan". 21 (2). Triple M Publications. March 2015. ISSN 1173-2229. ^ "Railfan". 21 (3). Triple M Publications. June 2015. ISSN 1173-2229. ^ "Current Status on DC/DFT Locomotives (Official Information Act request)". fyi.org.nz. KiwiRail. 22 July 2015. Retrieved 27 December 2017. ^ "Railfan". 25 (1). Triple M Publications. December 2018. ISSN 1173-2229. ^ "Future of Dc class and preservation (Official Information Act request)" (PDF). fyi.org.nz. KiwiRail. 10 September 2018. Retrieved 11 December 2018. ^ "KiwiRail DC Locomotive Disposal RFQ". 19 November 2018. Retrieved 21 November 2018. ^ a b c "Diesel Locomotives". New Zealand Rolling Stock Register. Retrieved 30 January 2019. ^ "Glenbrook Vintage Railway - Locomotives". Retrieved 28 January 2019. Barry, Colin; Brouwer, John; Dash, Colin; Dickenson, Peter; Shalders, Bruce (1988). Cavalcade 125. Ferrymead 125 Committee. Retrieved 22 March 2019. McClare, E J (1980). New Zealand Railway Diesels. Wellington, New Zealand: Southern Press. ISBN 9780907769286. KiwiRail Locomotive and Rolling Stock Register - 2011. Mosgiel, New Zealand: Triple M Productions. 2011. ISBN 978-0-9582072-2-5. Wikimedia Commons has media related to NZR DC class. See also: Locomotives of New Zealand. This page was last edited on 26 April 2019, at 02:05 (UTC).